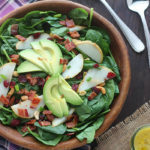 Spinach pear salad with dried cranberries and bacon is satisfying enough to serve on its own as a meal or as a side salad. In a smaller, separate bowl, whisk together vinaigrette ingredients. Toss to combine before serving.